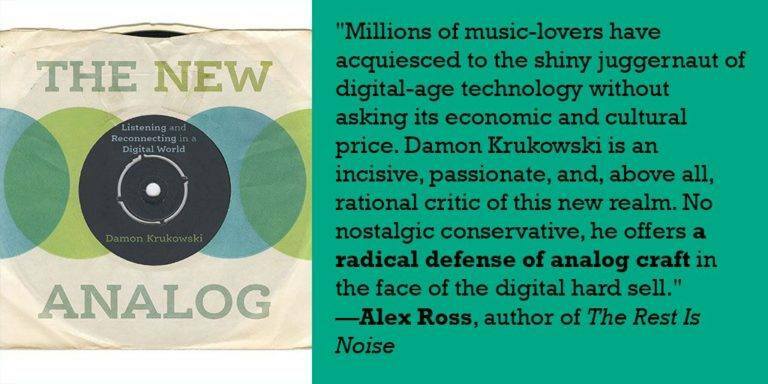 Librairie Drawn & Quarterly is pleased to host the release of Damon Krukowski's latest book, The New Analog: Listening and Reconnecting in a Digital World, published by The New Press. Krukowski will be in conversation with local professor Jonathan Sterne. Having made his name in the late 1980s as a member of the indie band Galaxie 500, Damon Krukowski has watched cultural life lurch from analog to digital. And as an artist who has weathered the transition, he has challenging, urgent questions for both creators and consumers about what we have thrown away in the process: Are our devices leaving us lost in our own headspace even as they pinpoint our location? Does the long reach of digital communication come at the sacrifice of our ability to gauge social distance? Do streaming media discourage us from listening closely? Are we hearing each other fully in this new environment? Rather than simply rejecting the digital disruption of cultural life, Krukowski uses the sound engineer’s distinction of signal and noise to reexamine what we have lost as a technological culture, looking carefully at what was valuable in the analog realm so we can hold onto it. Taking a set of experiences from the production and consumption of music that have changed since the analog era – the disorientation of headphones, flattening of the voice, silence of media, loudness of mastering, and manipulation of time – as a basis for a broader exploration of contemporary culture, Krukowski gives us a brilliant meditation and guide to keeping our heads amid the digital flux. Think of it as plugging in without tuning out. The event is FREE, and will take place in store at Librairie Drawn & Quarterly (211 Bernard West) from 7:00 p.m. to 9:00 p.m.